One of the most diversified markets in the industry, textile print offers a whole host of opportunities to print service providers (PSPs) looking to expand their business into new areas. What sort of technology do you need to purchase? How can you be sure that you are using the rights sort of consumables to achieve quality output? Should you be looking at extra training to ensure your staff are up to speed with the techniques and technologies for textile print? FESPA.com gets up close and personal with some of the top technology brands in textile print to find out how PSPs can succeed in this creative market. 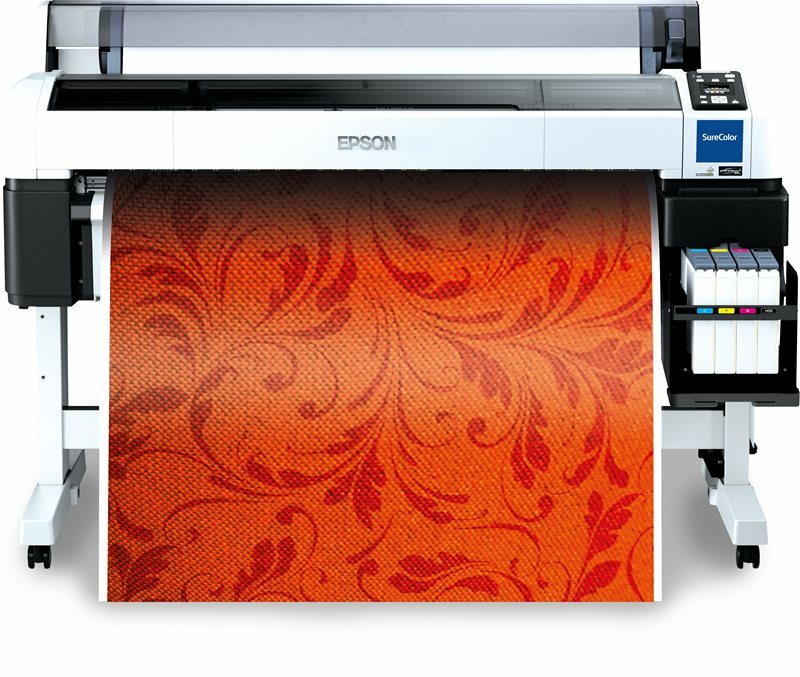 One of the most recognisable names both in textile print and in the industry as a whole is Epson. Heather Kendle, market development manager at Epson Europe, encourages PSPs to consider moving into textile print, saying the market offers huge opportunities. “According to Smithers Pira, the global market for inkjet will grow 9.4 percent each yea to reach $109bn (£84.7m/€95.1m) by 2023,” Kendle said. “IT Strategies predicts just 0.5 percent growth for signage over the next five years, while the textile market is still growing at seven percent CAGR. Epson has a wide range of this technology on offer to both newcomers and those already in the market looking to expand their presence. The Epson SureColor SC-F range includes two 64-inch models: the high-end SC-F9300 and the medium-to-high volume model SC-F7200. In terms of entry-level, Kendle said the 44-inch SC-F6200 is suitable for low and medium runs and could be an excellent starting machine for a PSP. With kit like this in place, Kendle said PSPs can produce customised workwear, sports team kits and décor, as well as soft signage and promotional products. But for those looking at additional work, then a foray into direct-to-garment (DTG) may be beneficial. Epson’s SureColor SC-F2100 costs around £11,000 and the user could add a pre-treatment unit for £3,500 and also a heat press for additional costs. The SC-F2100 features Epson’s Garment Creator software to support demand printing of cotton-based products, while the machine also has additional fast print modes and improved ink circulation for quick start up. Another brand synonymous with the global print sector is HP. The company has had a presence in the textile print sector for some time and last year used FESPA 2018 to roll out its new 3800 Jumbo roll product. Billed as its first real jumbo roll solution for flexible sign and textile printing in one device, HP has reported high interest in the 3800 Jumbo and Javier Larraz, HP’s large-format production director, GSB EMEA, believes this is down to how the machine help users access new markets. Larraz said: “Our customers are now able to expand their offering into new, high-value applications while also opening fresh creative ideas and concepts for sign and display. With this, Larraz speaks about HP’s history in the textile print market and why it value this sector of the industry so highly, drawing on the flexibility of HP Latex technology. He said: “We’ve been interested in décor and soft signage for a considerable time at HP and believe that in order to address this market, you need to have a varied choice in media alongside a technology that is suitable for indoor environments. “Since we launched HP Latex technology, we have been able to offer all the health and environmental benefits as it’s a water-based ink rather than solvent based. Elsewhere, Bert Benckhuysen, senior product manager EMEA at Mimaki, also backs PSPs to move into textile print, highlighting the amount of opportunities within the fashion sector in particular. Benckhuysen said: “It’s estimated that only 3 - 4% of today’s worldwide textile production is printed digitally, with the rest being printed using conventional analogue techniques. This demonstrates a great opportunity for PSPs to expand with digital textile print technology. Benckhuysen builds on this, also speaking about the growth potential for PSPs in other areas of textile print: “We also see growth in demand for textiles in other sectors, such as soft signage and home décor. With interior décor, there’s an increasing demand for customised home textiles, such as curtains or cushions. Leading on from this, Benckhuysen draws attention to some of the latest kit from Mimaki, namely the new Mimaki TS55-1800 and Tiger-1800B MkII. First, the TS55-1800 is a dye-sublimation transfer printer that, Benckhuysen said brings high-end features to the entry and mid-level market. These include high-speed one-pass printing at a high-resolution and high ink-density; unattended printing with the new Mini Jumbo Roll unit and a set of Mimaki core technologies for continuous operation. The Tiger-1800B MkII, an upgrade for the updated version of the Tiger-1800B, is a volume industrial textile production printer that offers speeds of up to 385sq m/hr. Users will benefit from high-quality print mode of 1200 dpi resolution as well as core Mimaki technologies such as the Mimaki Advanced Pass System to prevent banding, as well as Nozzle Check Unit and Nozzle Recovery System for continuous operation. Roland DG is of a very similar mind-set, with Paul Willems, head of business development and product management at the manufacturer’s EMEA division, said textile print opens up a world of applications. With demand for work such as soft signage, exhibition graphics, sports and fashion apparel, corporate wear and interior decoration on the rise, he called on sign-makers and PSPs should take advantage. Williams said: “For PSPs working in the competitive sign market, anything which enables them to differentiate themselves and to offer something different to their clients is advantageous. And, of course, offering textile print services will enable PSPs to pursue new business, potentially allowing them to grow in previously unexplored markets. Williams leads on from this to outline some of the solutions that are on offer from Roland DG, including the new multi-function Texart RT-640M. The latest addition to the Texart dye-sublimation range, the machine offers direct-to-textile and indirect sublimation in a single device. Roland DG will soon launch its new VersaSTUDIO BT-12, a compact direct-to-garment printer that prints full colour graphics onto cotton-based items such as t-shirts, tote bags and textile interior decoration products. Available from April, the machine can print sharp, colourful photos, logos and text directly onto a wide variety of products. This closing statement sums up the situation in the textile print market; much is going on in terms of development and there is a lot to get excited about when it comes to taking on new work. By planning your move properly and investing in the right type of kit, you can make a successful transition into textiles.